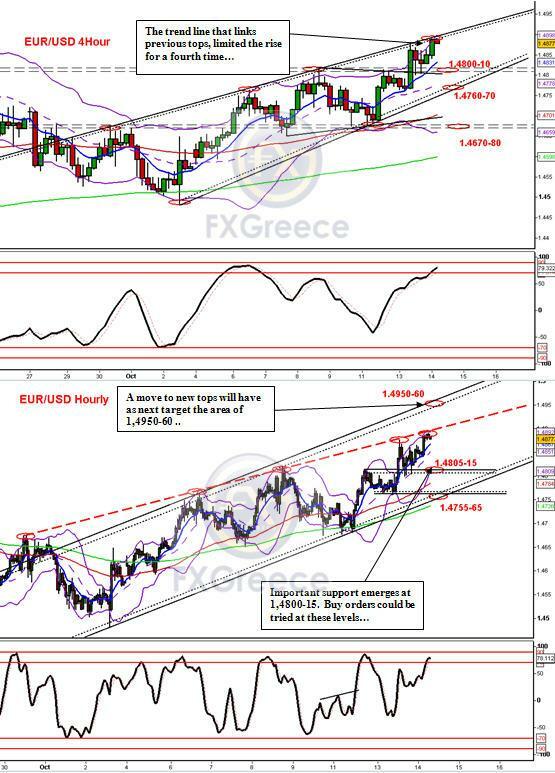 Comment : Dollar is still under pressure, and as a result euro is moving to new tops, close to 1,4900 area, confirming our basic scenario. Next target should be at 1,5100 area or higher. After yesterday’s tops, important resistance levels have been reached for the short term, as you can see in the 4 hour and hourly chart. 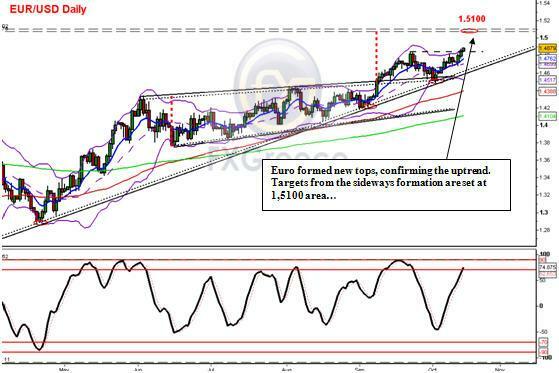 This indicates that a corrective move or a sideways formation between 1.4800-10 and 1.4890-00, is possible. A move above 1,4900, without a previous retracement below 1,4850, confirms the bullish strength, and a move towards 1,4930-60 would be possible . Next targets are set at 1,5000 and 1,5080-5100, which is the basic target from the break of the wider 3month consolidation. First intraday support emerges at 1,4860-70, followed by a more important at 1,4800-10. Below 1,4800 next target will be at 1,4750-60, which is the range for the upward scenario. *STRATEGY: We will follow the trend, trying buy orders at the retracements towards 1,4850 and 1,4815 area, placing stops below 1,4750. Our target will be at 1,4930-50.